Diabetes & Hypoglycemia: What’s the difference? People often confuse diabetes and hypoglycemia, and although these two conditions may seem similar, they’re not the same. Diabetes is a chronic disease in which a person suffers from high blood glucose (blood sugar), either because the body fails to produce enough insulin (a hormone that controls the body’s glucose level), or it may not produce any insulin, or both. 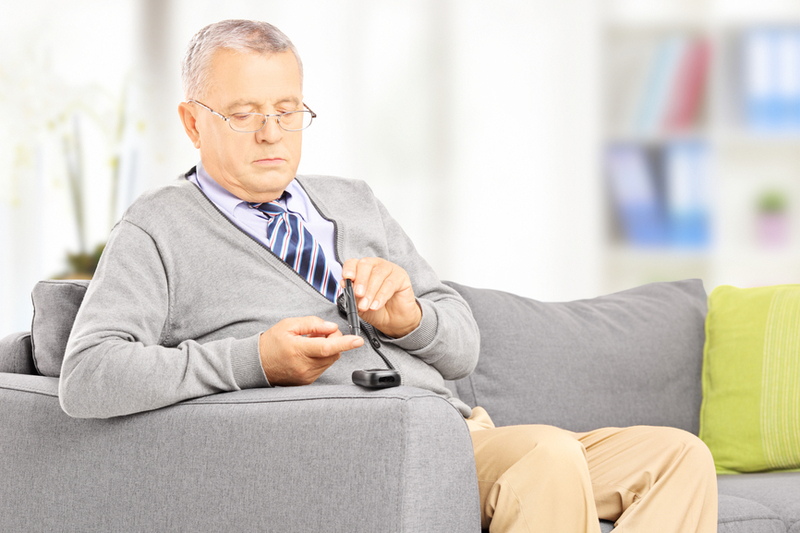 When a person has low blood glucose levels the condition is called hypoglycemia, and many people living with diabetes are at risk of having this medical condition. In an earlier post we discussed the question, “What is diabetes?” Let’s take a look at hypoglycemia in more detail and discuss what you should do if you find a person in a diabetic or hypoglycemic emergency. Low blood sugar is defined as a glucose reading below 70 mg/dL, and it can be potentially dangerous below this threshold as your body is unable to carry out its normal function. If you suspect that you or someone you know is suffering from low blood sugar, make sure you treat it immediately. Eat something with at least 15 grams of carbohydrates, such as three glucose tablets, four ounces of fruit juice, or a tablespoon of sugar, honey, or syrup. Check your blood sugar after 15 minutes of eating to see if there’s an improvement. You may have to repeat this process once more if your blood glucose is still below 70 mg/dL. Be sure to contact an emergency center right away if your blood sugar levels don’t improve after eating a snack. Never drive yourself to an emergency room when your blood sugar is low—get a ride or call 911 for an ambulance. In a diabetic emergency, move the person into the recovery position (i.e. lay the person on his or her side—make sure the head is tilted back and the knees are bent) and call an emergency center. Do not give the person anything to eat or drink if he or she is unconscious. If the person is conscious, make sure you give him or her something with sugar, such as a soft drink, glucose candy, or a sandwich, and monitor the person’s condition until help arrives. Remove the food or drink from the person’s mouth if he or she begins choking. Even if symptoms begin to dissipate, the person should still receive medical attention in case a further complication develops. It’s important to note that it can be dangerous to give someone insulin during a hypoglycemic attack, which can lower blood glucose levels even more. People who have this condition can become unconscious from an insulin reaction, in which case a medical professional will need to administer a glucagon injection to treat the person’s low blood sugar level.